And I thought the unpicking (see yesterday's post) was going to be the pain part of this block. Boy was I wrong. What really drew me to this pattern was the curves on the inside. I have never pieced curves before and have wanted to learn how. Well I think the next time I try something new, I won't find the most difficult pattern that teaches that technique. That is a beautiful block. Well Done. You should try one of those Curve Master feet (if you don't already have one). I bought one at a quilt show. Left it in the draw for 2 years and then finally had the courage to attach it to my Pfaff. Brilliant. No pinning. No tears. That looks so great! Good for you for sticking with it. Melissa, you are amazing. Having sewn lots of curved seams in my life for dresses and blouses and whatever else, I cannot imagine how incredibly frustrating and obnoxious it would be if they had to turn out perfect in the end. I'm always fudging something, and that just would work on a quilt block. It's beautiful! Your block is beautiful! I don't know that I would have stuck with it as long as you did. Maybe you could make it into a pillow. You have way more patience than I do! Nice job. Oh my goodness that is gorgeous! A curved foot, huh? (I was reading your comments.) That might be something to check out. It's a beautiful block...all that hard work was worth it!! wow, you stuck with it. I would have been so frustrated. Your effort was definitely worth it. Such a great block. Beautiful block! Had a giggle at your comment--I do that myself. Start with complex and hard instead of taking baby steps. Then kick myself every step of the way and wonder why oh why did I ever start this! Good for you though, you finished in style! I think it looks great! I can imagine how hard that was to piece the curves. It turned out so cute. Man that was a project and a half. Sometimes having a blog really makes us keep on doing stuff 'cause everybody is watching. If we were doing it all alone it would be much easier to throw it in a drawer and forget about it. Good job at working through it. Now how about some feathers. It looks pretty darn good to me and complicated enough to scare me away. Congratulations on the preserverance. That is a GORGEOUS block! Wow! It looks perfect from here! You did a great job. I like all the curves too...it looks very hard but it sure is beautiful! 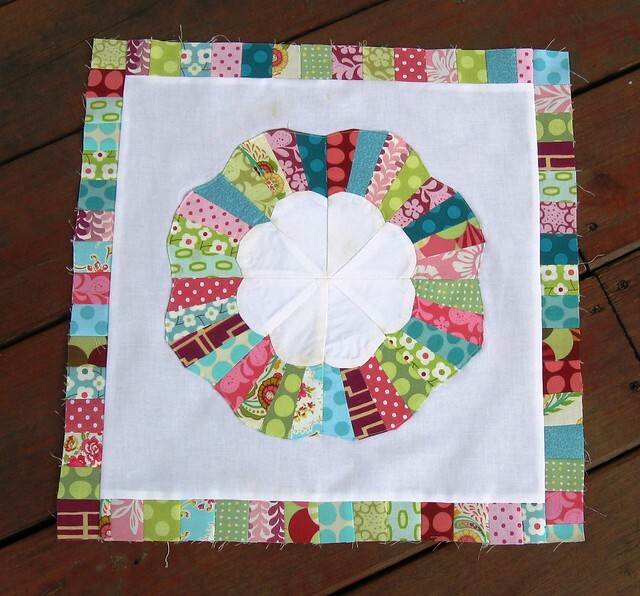 You are a great quilter and your work definitely shows!! Whoop,whoop!!! Oh what a lovely block! Beautiful block, Melissa! I'm so glad you linked up with us today! Whoop whoop! !